In the courtroom on Qahira, the politically influential planet formerly known as Mars, a military tribunal asserts Hardlaw killed numerous Solgov officials during a secret mission on a rebellious world. Many local populations are hostile to Solgov, having been indoctrinated for years by ultra-right separatist groups. Let’s start off with the graphics. The game is top-notch : the maps are very large (just look at the screenshots, you can really see thousands of kilometers in the distance – the maps really deserve to be called “extensive”) and the graphics are realistic indeed. For the record, we have to mention the game uses a tweaked version of the Serious Sam engine. The game ran very well on my system with all settings on maximum (AMD Athlon 64 3200+ and XGI Volari Duo). One of the first things I noticed was the impressive AI of the game. The squad members reacted surprisingly well in all occasions and actively cover you. For instance, when I was ambushed by some opponent characters, my team swept in and took card of the enemy before I had time to reload my weapon. When my character was injured, I could even “hide” behind some of my team members while they took care of the enemies for me. I was really surprised how well they reacted. To be honest, I half expected them to be sitting ducks (as in many other game titles), but they did not. As for the enemies, they will retreat when attacked, try to find cover when a shootout takes place and then counterattack. It was really refreshing to see the characters react intelligently. Surprisingly, path-finding was reliable too. The squad team reacted well even though the maps were full of long drops and steep slopes. It seems as though the game’s AI is not scripted at all. 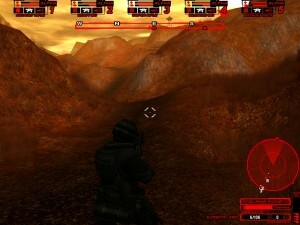 ABZ uses a system of keyboard shortcuts to command the squad members individually or as a group. For instance, the Regroup command will have them follow you, you can order them to hold position, to hold fire or to fire at will. It’s too bad though you cannot tell them to fire at a particular target or to start firing only when you begin. It is possible however to switch between team members. We mentionned earlier that the game is a team-based tactical shooter, but you do not need to play as a team if you do not want to. Nothing prevents you from playing like in a first person shooter and be a lone gunman. Only one person is required to accomplish mission objectives so you can choose how you want to play. One thing I would have liked is a map in order to know exactly where I am. As we mentionned, the maps are pretty huge, and it is not obvious to find your way around : you can’t just walk straight without paying attention to the terrain especially since it is very mountainous and riddled with high cliffs. On the other hand, adding a map would probably make things too easy and there would be no surpise element left. Last but not least, I found the difficulty level of the preview version that we tried not easy at all, quite challenging in fact. Granted, I’m just an average player, but I don’t think many people will find finishing the game a piece of cake. All in all the game looks and sounds great. It definitely looks like a promising tactical shooter. Kudos goes to GMX Media for their great work and kudos to Khaeon as well, a company which seems set to become be a serious threat to other FPS developpers in the near future. Подробности window washing manhattan здесь..